Use these powerful techniques to take the belt from Khabib ahead of UFC 229. After nearly two years, the “Notorious” Conor McGregor returns to the Octagon to challenge Khabib “The Eagle” Nurmagomedov for the Lightweight championship at UFC 229. 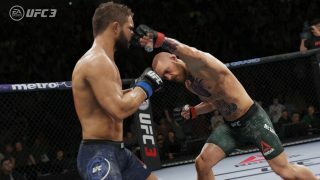 You can reclaim Conor's 155 pound belt with the fight before the fight in UFC 3, and as the biggest matchup in the game, you'll want to know how to take advantage of Conor's strengths. Use powerful left hand shots, control the center of the Octagon with evasive maneuvers, and avoid Khabib's takedown attempts to capture the UFC Lightweight belt as Conor. 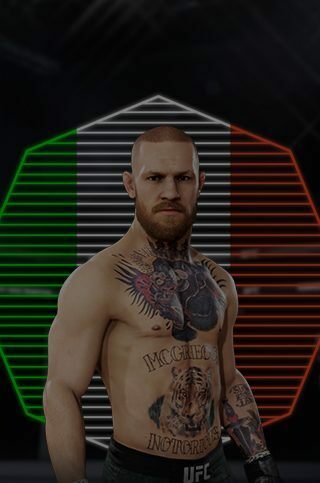 It's no secret that Conor's most powerful weapons are his hands, which is why it's essential to learn stand-up controls before fighting with “Notorious.” After all, his striking rating of 95 makes him one of the most devastating boxers in UFC 3, and you'll need to take advantage of that in order to put Khabib away. The X/Square button is one of your best options at the start of the fight, as this will unload Conor's signature left hand, especially if you use a modifier like LB/L1 that creates a bigger strike like the left hook. From there, you'll want to use footwork and dodging, followed by counter strikes that will slow Khabib's forward pressure. Landing punches will wobble Khabib, and if you time the left hand just right, Conor will be walking away with the belt ahead of UFC 229. Conor's confidence is a weapon that strikes fear into his opponents, and in UFC 3, a commanding way to assert your presence is controlling the center of the Octagon. Keep pressure high by moving forward while throwing combinations, staying behind the jab as you look to land a big left hand. Khabib likes to push forward with his wrestling, so taking control of the center of the Octagon will be difficult yet rewarding. Use your striking as you push forward, keep Conor's footwork active with the left stick, and make sure you stay within striking distance to avoid being taken down. As part of Gameplay Update #8, dodging a forward-moving fighter's strike and creating an angle greater than 45 degrees will increase the power of your strikes, allowing you to perform very fast counters with high damage output. If Khabib comes out swinging, slip his punches with the right stick, and land a punch of your own for an enormous impact. Use the LB/L1 modifier for a more significant dodge, increasing the size of the angle you create, at the cost of more stamina. Once you've taken control of the Octagon, you'll want to look for moments to fire off some of Conor's mightiest moves. His left hook should be one of your go-tos, which can be performed with LB/L1 and X/Square; it's particularly effective after slipping one of Khabib's strikes. The left overhand and uppercut are other great options for dealing damage with Conor, especially when used in three punch combinations that start with a jab. Throw the three punch combination, topped off with a left hand, and reset your distance while maintaining Octagon control. Conor's hands aren't his only weapons, as he's got an arsenal of kicks that are all a part of overwhelming his opponents with striking. His hook kick, lead body side kick, and side leg kick are good to mix in with boxing combinations, especially in the opening stages of the fight when Khabib will anticipate punches. The goal of fighting as Conor is to swarm your opponent with combinations and evasive movement, and once they're feeling the pressure, drop the hammer with a powerful left hand counter. While finishing the fight will rely on Conor's supreme striking abilities, it will be just as important to focus on avoiding the takedowns of Khabib in order to win the fight. As Khabib lunges towards you, hold RT/R2 and push the right stick down at the correct moment to stuff Khabib's attempt at bringing you down. You could also throw an uppercut as Khabib lunges forward to catch him coming in, as this will stun the champ and make him think twice about going after takedowns. In the time it takes Khabib to get back to his feet, you'll have another opportunity to reset your position and maintain control of the cage. If you do find yourself under Khabib's grips, you're not doomed, as there are numerous ways to escape the positions Khabib will put you in. Don't panic and use more stamina than you need, as having your escapes blocked by Khabib will cost you a lot of energy and put you at risk of being finished. If you get back to your feet, continue to stay at range and avoid takedowns, while looking for boxing combinations and counters in response. Learning striking controls, using evasive movement and counter striking, dropping serious shots, and avoiding takedowns are the keys to victory for Conor McGregor in the fight before the fight. Leading up to UFC 229, make sure you check out how the fighters are performing in game, with daily updates based on community-driven results. The king is back, and it's time to claim his crown. Get your copy of UFC 3 today, and play the fight before the fight with the Notorious Edition, available October 2-16, 2018 for Xbox One and PlayStation 4.